With realization, in the association of people who have faith, the natural faith, which is within our heart awakens. Real faith is not something that is imposed upon you. Real faith is awakened from within in the proper environment like a seed. A seed if it is watered properly, it grows into a beautiful flower. So, in order to have such confidence in which we are actually willing to take the great apparent risk of dying to live, sadhu sanga is most important. Sadhu sanga means association of devoted people. Otherwise, the campaign of maya or illusion which is all around us is directly or indirectly speaking, better to reign in hell than to serve in heaven, better to be the proprietor and the enjoyer in this world of illusion than to be a servant in the ecstatic realm of dedication and devotion to the Lord. Sanatana Goswami had very, very painful itching sores all over his body due to drinking some bad water when he was traveling in the forest, and it was causing him so much pain. When he came to Jagannath Puri, he came before Lord Chaitanya. Now, in his mind, he was thinking that my body is totally useless, it is covered with all these diseases. During the Ratha-yatra festival, I will throw my body under the chariot of Lord Jagannath in the presence of Lord Chaitanya and his devotees and die, and then perhaps I will get a better birth in my next life. 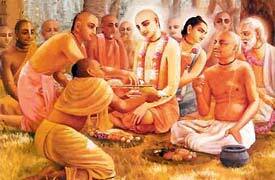 He did not speak his thoughts to anyone, but Lord Chaitanya understood his heart and spoke. He said, Sanatana, you are a criminal. You are a criminal. You want to destroy someone else’s property. You have already surrendered your body to Me, so how can you kill what is Mine? Then he told Sanatana Goswami, if just giving up this body or killing this body will bring us to Krishna, he said, I would have already killed this body tens and tens and tens and millions of times, but it is not by killing this body, it is not by the death of this body that anyone can go to God. It is by purifying the heart. It is by dying of the ego to live eternally. 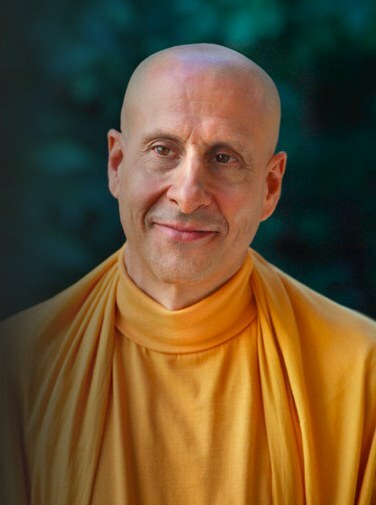 ← Radhanath Swami on What is more logical? Escaping from body’s pain by destroying it, never helps one to be happy. Purifying the heart can make one to be happy. All glories to HH Radhanatha Svami Maharaja. Radhanath swami maharaj explain the essence in most simplified and heart touching way. Thank you maharaj very much. Sadhus like Radhanath Swami are the only hope for people aspiring to make any spiritual progress in this age. And any one can clearly see the power of maya or illusion. Even the most sincere and strong looking are pulled down by Maya in a moment, what to speak of the ordinary mortals.